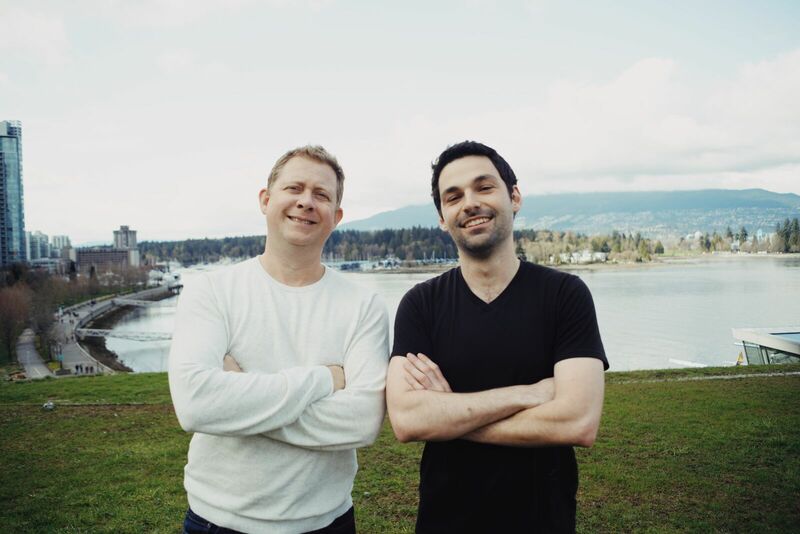 Kris Hartvigsen and Justin Vallaincourt are the co-founders of Dooly.ai. Headquartered in Vancouver, Dooly is a software company that aims to help sales professionals reduce time spent on administrative tasks using AI. Recently, they have raised a $2 million seed fund and have expanded to a team of 10. 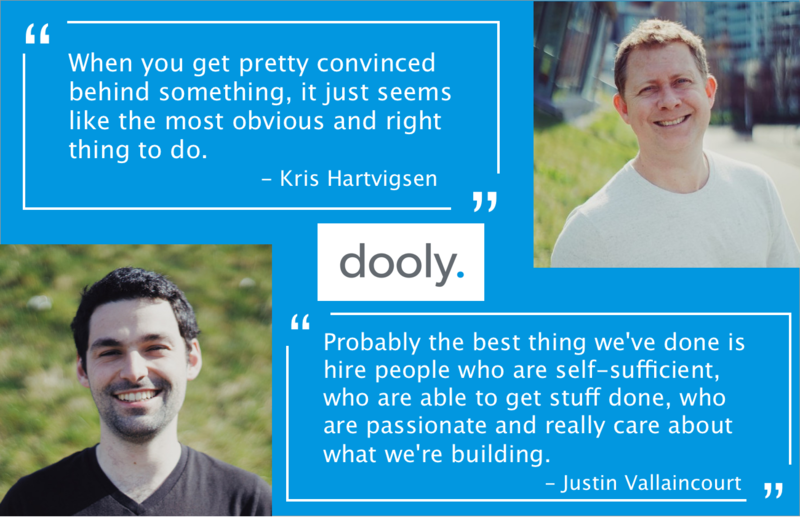 As the CEO and CTO of Dooly, Kris and Justin retrace the steps of why they started Dooly and how they are building Dooly to solve pain points faced by sales teams. You will get to hear their experience as tech entrepreneurs, their advice on starting a SaaS or software-as-a service business, and why instead of taking funding from the Silicon Valley, they decided to giving back to the community by hiring local talent and grow Dooly in Vancouver. We had the conversation in their awesome new office in downtown Vancouver. The following excerpts are some highlights from our conversation. Kat: "How did you guys start Dooly?" Kris: "I've been in sales my entire career. There are challenges that surface in your day that get you away from being in a selling mode. A lot of those are admin tasks, and things that you have to do to communicate to the business what you have learned from the customers, and then all those things you need to have the business communicate back to your customers. When I started running teams, it was pretty apparent that it was hard to coach a team. We didn't know what was going on in their deals, so you spend a lot of time on meetings and white-boarding sessions. Frankly, it's really inefficient. It's just drawing people away people from earning their pay-checks. The idea behind Dooly is to figure out ways to help sellers to be more effective, more enabled during their calls without having to spend a lot for time maintaining the interaction, flows and stories that they capture from their customers back to the business. Dooly is a sales enablement platform. We focus on ensuring the seller has the sales tools that they need to do their job and in the moment of truth, which are really important in the sales process. By distributing information to the business, which is almost like you are setting up different series of beacons, it allows the business to attach key information whether it be win-loss data, case studies, white-paper, anecdotes from another customer that would help to validate the pain and need. So you are trying to find those key signals and once those signals are populated with information, you can actually use that as a mechanism to real-time feedback to the sellers." Kat: "Dooly has recently raised $2M seed funding, Congrats! You pitch Dooly as the software that helps sales professionals reduce time spent on administrative tasks using AI. AI has been such a hot buzzword in the tech world, so every time when I hear a startup's value proposition contains "AI" in it, I become curious but also a bit skeptical. Could you share with us what is Dolly and how does this "AI" component make Dooly powerful?" Justin: "Our AI component really boils down to how we distribute the information and how we surface those key enablements such as case studies. We have a secret sauce through which we pull the most relevant information throughout your organization and try to present that to you. We also have a few other AI components including real-time transcription of calls using neural-networks. We can plug the transcription in our real-time enablement which sorts the information to help progress your call. In addition to that, we also try to analyze your notes and figure out which parts of the CRM (Customer Relationship Management) can be automatically updated for you, which in turn helps you to find similar deals so that you can continue to progress the conversation." Kris: "Every company has a fairly limited vocabulary that refers to their product, so you are looking at a very specific pain, need, a set of competitors and so on. So we look for those signals, and overtime, we should be able to identify not just where that information should go, but also what information might help you to progress that deal. Most of the analytical platforms out there today are very numerically-driven; but the things that help you to progress a deal are what, where, when and why. We want to find that structure and the signals that actually are going to validate why something is good or why something is bad." Kat: "What are Dooly's distribution channels now and growth tactics?" Justin: "I think growth is like a step-function. When you release a great feature, you first have some uptake, then it takes some time for the virality to kick-in. I also think for growth, you need to take a long-term approach. A lot of people try to hack it quickly but they don't have the substance behind it. Everything we're building into the product takes into account our plan for the next six to twelve months. We're trying to build something that's sustainable and compelling. That's why there are small things in the product that buyers might not notice during a deal cycle. But in aggregate, that's why buyers love us." Kris: "We go through a number of different channels, and we try to go directly to users as much as possible. A couple of interesting things on sales people, they churn at a rate of 25% year over year. So our goal is to ensure that we create some viral effect within the product so that people can pick it up easily, love it and take it with them when they go to another company. It's all about product-led growth. We're also very active in terms of getting our voice out there through social channels, but also through app exchange. We are leveraging Salesforce sales force app exchange as a proxy for us to get to different users and companies. Beyond that, we do a lot of direct selling, we try to identify people who are mavens in their organizations." Kat: "Sounds like Dooly is doing all these amazing things. How many people are on your team now?" Kris: "We're 10 people right now plus a dog. And if anybody's looking for a pet-friendly environment for their next gig, we have lots of space for the dog to roam around and be happy. We got a team that's half engineering and half go-to-market now." Kat: "In the Betakit article, you talked about Dooly having had the opportunity to take funding from Silicon Valley, but decided to commit to grow in Canada. What's the reasoning behind this strategic decision? What are the advantages and disadvantages of this decision? Kris: "We want to stay friendly and also tax-friendly to the Canadian ecosystem that has been supportive of us in the early days. But if you want to look at it from a more selfish perspective, how many great made-in-Canada stories are through-and-through Canadian? We want to be a through-and-through Canadian company as much as we possibly can. The job isn't about the pay, it's about paying it forward. I believe that you owe it to the local ecosystem to pay it forward and to build that ecosystem. My career started here and it's built here because other people took a chance on me in the early days of my career. I want to afford the same opportunity to other people in the local community." Justin: "We're really proud Canadians. I'm very excited about the idea of building a company here, retaining talent here. I use it in my recruitment pitch, and everyone that works here feels the same way." ðŸ¥� What has been the most important skill in building your business? What's your advice for aspiring entrepreneurs? Justin: "As millennials, we're very distracted. Actually I think some of the advice in the valley can be counter-productive. You will hear people telling you to start your company, spend 2 months on it and if you don't have traction within those 2 months, you can quit and do something else. Something I learned from Kris is that it's important to be very persistent. Even if an idea doesn't take off within the first 6 months, that doesn't mean you should give it up entirely. I think the other thing is the ability to recruit top talent. The best thing we've done is hiring people that are smarter than myself on the engineering side. People who are self-sufficient, able to get stuff done and really care about what we're building. We probably interviewed 40 engineers and ended up hiring 2." Kris: "The other super important thing don't get happy ears. You have to listen to the market and really pay attention to what your customers have to say. Don't go in with pre-conceived notions of what they are going to say. You have to be able to adapt to what your customers are saying and be really honest with that feedback. Another critical thing from a business's perspective is that fundraising is really hard. You need to work on fundraising almost as a full-time job if you are trying to raise money. So if you think that you can get a product to be profitable without fundraising, then focus on getting the product to profit, otherwise fundraising will erode your time heavily. Another thing is that I'm not your typical startup entrperenr who's in their 20's, doesn't have much to lose. I have a wife, 3 kids, i'm pretty deep into career. So taking chances at that point is pretty tricky, but when you get pretty convinced behind something, it just seems like the most obvious and right thing to do. I'm also teaching my kids a little bit about the odds of possible. I think there's a pretty cool lesson in that." ðŸ‘¥ How to find co-founders for your business? Kris: "Choosing your dance partner really wisely. The one thing that's really good about Justin and I is that the only area we overlap on is product. Our skillsets are largely different from one another in terms of what we execute on a daily basis. Justin is incredibly technical and great with running the engineering team. I focus on go-to-market, legal, finance, and partnership with Salesforce. So there's not a lot of confusion with the roles." Justin: "It's easy to just jump in, find a co-founder and split the equity a certain way. But what you don't necessarily think about is that you are entering a long-term relationship. It's probably gonna be 5-10 years before this thing is fully seen through, finished or going bankrupt. It's really important to figure those things early on and make sure you're compatible." Kris: "We don't always agree on everything, but we do agree on a lot more than we disagree on. We're very good at hearing each other out, that's a really important thing for anybody who's in the startup space or in the managerial roles. You have to spend time listening, hearing what people are saying, and not just going in with your locked-down answers. Be more open-minded." ðŸ“š Could you share with us your role models or any useful resources from which you draw inspirations and helpful insights? Justin: "Right now, I'm reading a book called Principle by Ray Dalio. It's a collection of principles that Ray Dalio, who runs one of the biggest hedge funds in the world, operates by. I really like this idea of having a set of guiding principles or some external compass to help figuring out what to do in life. I can't really pinpoint a specific role model off the top of my head. I look for people who are fair, supportive, respectful, try to do good and make this world a better place." Kris: "It is alarming how similar reality is to the TV series Silicon Valley. I might be a combination of Richard and Erlich. It's really surprising and fascinating to watch this show and say I can totally relate to that!" I draw a lot of inspirations from business across America. I get inspirations from my kids and a lot of encouragement from my wife. She's an incredible supporter and go-to for me for a lot of things. I draw a lot of inspirations from our team. Our team is great. I'm ceaselessly amazed at the quality of work they deliver. The good thinking behind their work impresses me the most." You can find more about Dooly on their website, and follow them on Twitter and LinkedIn. If you're in Vancouver, feel free to drop by Dooly's new office next to the super popular Jam Cafe on Beatty in downtown Vancouver. When you see a long line-up at the door, you might catch a glimpse of Kris, Justin and the Dooly team right next door.